All CCAeLearning webinars are free to CCAE members. An unlimited number of advancement staff can participate. Sessions run from 1 - 2 p.m. Eastern time. Visit the CCAE website for more information. Registration opens in early August. Start planning your TD Insurance Fellowship program now! Summer is the ideal time to begin planning your application and seeking a candidate for one of two coveted TD Fellowships in Advancement. Check the resources on the CCAE website. Friday, January 12, 2018 is the deadline for completed applications. Got a job to fill? Looking for a new advancement position? Visit the Careers section of the CCAE website. Posting a job is a free service to CCAE members, and viewing available advancement postings does not cost a nickel. A new online community of practice is available for those who work in or with donor reporting. The goal is to share best practices, ask questions and discuss resources. 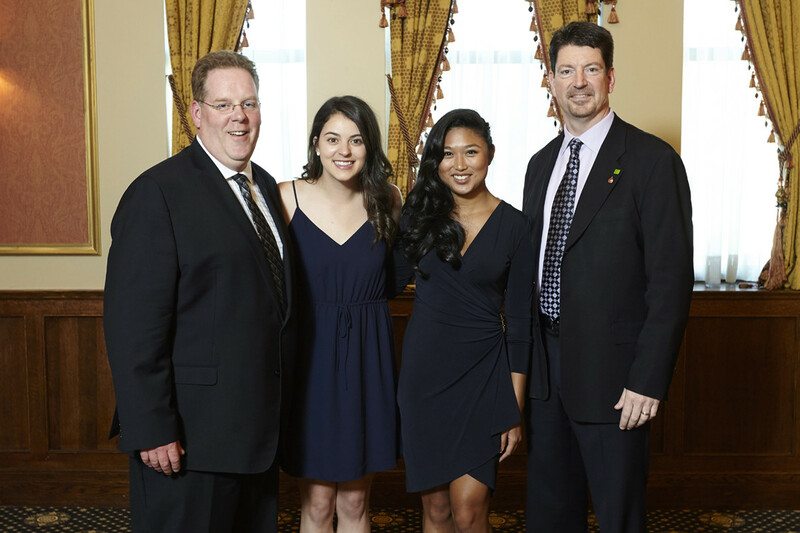 2017 TD Insurance Fellows Anne-Marie Aguilar, University of Alberta, and Sarah Carthy, Trent University, with Scott Grant (left) and Max Stiles of TD Insurance.